This preview covers two more second round matches from Friday’s order of play at the 2016 BNP Paribas Open in Indian Wells including Madison Keys v Nicole Gibbs and Jelena Jankovic v Carina Witthoeft. For a full preview of arguably the best women’s match of the day on Friday between Agnieszka Radwanska and Dominika Cibulkova, click HERE. A first career match-up between two Americans, Madison Keys and Nicole Gibbs, is 4th up on Stadium 4 on Friday’s schedule at the BNP Paribas Open. Gibbs has become a WTA fan favourite after she endeared herself with a poignant, honest and frankly fabulous post on social media at the end of last year (see below). As Gibbs highlighted in her post, she picked up some confidence on the ITF circuit at the end of 2015, reaching three finals in Kirkland, Waco and Carlsbad. In 2016, the 23-year-old has continued in much the same vein; Gibbs has already won 15 matches this year with the highlight being a second WTA quarter-final in Monterrey. Up to number 95 in the rankings, Gibbs is knocking on the door of her previous career best ranking of 84. Gibbs scrapped through her final qualifying round match in Indian Wells against the number one seed, Anna-Lena Friedsam, 6-4 5-7 7-5 in two hours and 30 minutes. The American had led 6-4 *4-1, but needed three sets to get the job done. While there was a concern about fatigue with no break days between qualifying and the main draw, Gibbs expelled those fears by thrashing Alexandra Dulgheru, 6-1 6-0, and breaking the Romanian’s serve on all seven occasions. Keys has played just one tournament in 2016, reaching the last 16 of the Australian Open. She didn’t play any warm-up events in Australia due to an elbow injury and then lost to Shuai Zhang in gut-wrenching fashion, aggravating a previous leg injury. Before that match, Keys had been impressive, defeating Yaroslava Shvedova and Ana Ivanovic in three sets. The win over Shvedova was particularly noteworthy as she recovered from a set down, not by playing pure-power tennis, but with solid tactics and staying mentally in the moment. Interesting stat: Gibbs is a perfect four out of four in WTA qualifying tournaments in 2016; she has successfully qualified for the main draws in Shenzhen, Melbourne, Monterrey and Indian Wells. Furthermore, she’s won at least one main draw match at each tournament. Jelena Jankovic returns to the desert with a shedload of points to defend having reached the final last year. On Friday, she opens her account against the 21-year-old German, Carina Witthoeft. The Serb has always saved some of her best tennis for Indian Wells having previously won the title back in 2010. Despite a poor start to the year, the former world number one has proven in the last six months that, bolstered by a much-improved serve, she can get it together. Hong Kong was a prime example where she beat Venus Williams and Angelique Kerber en route to the title. However one of her greatest strengths, being consistent and toughing out wins, is no longer the asset it once was. It’s fair to say that JJ is prone to the odd (or more frequent!) mental implosion. I had the pleasure of watching Witthoeft’s match against Irina Falconi… it was one of those matches that was so bad, I was almost compelled to keep watching! Witthoeft eventually defeated Irina Falconi, 0-6 6-4 6-4. Witthoeft was terrible in the first set, hitting a ton of errors long and trying to be aggressive, but not with any sense of control. She was visibly tearful on a changeover towards the end of the first set. Witthoeft buckled down in the second set as Falconi offered up some errors of her own. Witthoeft needed four set points to force the decider and then carried that momentum into the third set. It looked like a seven-deuce game at 3-3 would ultimately determine the outcome of this match. Falconi eventually broke on her sixth break point, having missed the first five with some inexplicable decision making. However, in a slightly surprising turn of events, Witthoeft won the last three games to secure a vital win. The stats weren’t kind to either player… Witthoeft hit 20 winners to 48 unforced errors, while Falconi hit 17 winners to 40 unforced errors. It wasn’t an impressive performance by any means, but Witthoeft showed plenty of fighting spirit, and got stuck into the rallies in a tight third set. Head-to-head record: Jankovic and Witthoeft have never played before on the WTA tour. Interesting stat: Both players are looking to win back-to-back matches for the first time in 2016. Witthoeft has a 4-6 W-L record for the year, while Jankovic is at 4-7. Final thoughts: This is the type of the match that you expect Jankovic to win, but she somehow finds a way to lose! Witthoeft showed some heart in her win over Falconi but it was not a strong performance and if she continues at that level, she will find it hard to get the win here. I’m actually going to give JJ the benefit of the doubt despite her recent results and customary hiccups; she has the stronger game and should be able to build on her continued love affair with Indian Wells. March 10, 2016 in Gibbs, Indian Wells, Jankovic, Keys, Witthoeft, WTA. I like Witthoeft. She looks like Lisicki and Kerber had a baby whose cousin is Kvitova. I’m going Gibbs and Jankovic in 3 sets. She is an error machine like Kvitova. Falconi should have won if she didn’t choke. Based on JJ past experience in IW, she should beat Carina. I reserve my comments about Keys because her status is unknown and Gibbs could be tired by now. I dont think Falconi choked. Her serving just isnt good enough and Catrina was reading it like a book. Falconi did play a poor final game although i’m not sure i would define it as a “choke” – I hate using that word, it’s overused in my opinion as a lot of situations also involve the opponent raising their game which gets ignored most of the time. Witthoeft wasn’t playing well but she did improve and was making far less errors at the end. When Falconi played so well in the first set and the first half of the second set before losing the second set. She also played well in the third set before losing. She is well known of choking in this kind of situation. If “Choke” is not the best word to use, I don’t think you can find any word to describe the situation. Unless Carina played an extremely well third set but she was not playing good tennis. You could not say Carina overcame slow start to beat Falconi…..
You may not like the word “CHOKE” because Carina is your favorite player. From my point of view, Falconi choked big time to lose regardless whether you like it or not. Period. I think it will be on Jelena’s racket. If she plays her best tennis I think she’s too good for Carine, and as others have said she usually does well at IW. Maddi Keys should win the other one but I’ve got a feeling Nicole will play better than her ranking suggests and win in three sets. Gibbs vs Keys looks more tight…3 setter likely with edge to Gibbs.The other one is all about how mentally fit Jankovic is. Please…this is crap. Carina is like another Kvitova, you don’t when she will show up. Sorry Graham, this message is meant to reply Andrew. However, I do agree with your sensible comments. With all respect to Witthoeft, I doubt she’s anybodies favorite player. She’s certainly not mine. Why don’t you try putting all your negative comments in one reply next time instead of flooding an entire thread with argumentative drivel. I talked about facts. I response to you because of those craps. 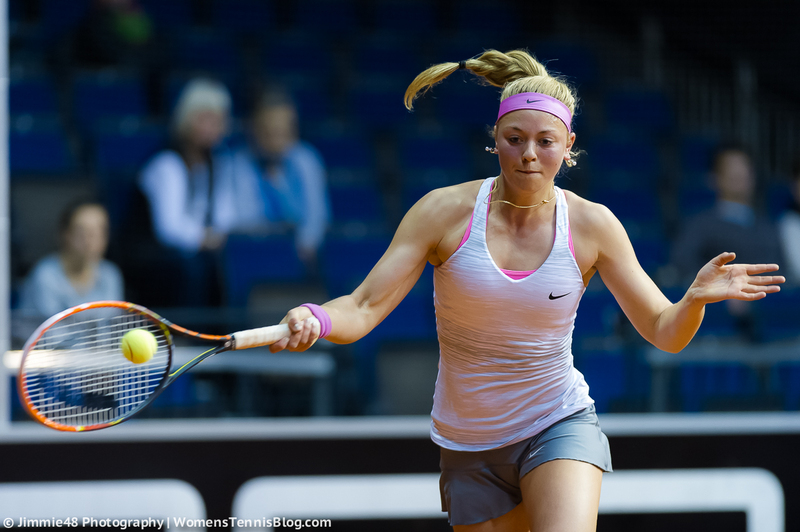 This is crap…but you are right that she is a mixed of Lisicki and Kvitova – error machine made in Germany. Ha ha! Nein, Lisicki is a german idea but made in the USA, Florida to be precise. Carina is still being made( at 21years) so any technical errors will be ironed out. i’m going with Jankovic for the win, can’t see it any other way. Qualifiers may have warmed up Gibbs so she has the advantage, Keys has to play a focused blinder to get this. I hope she does.